Photographers and reporters are mastering a multitude of skills to create online projects that reach readers in new ways. While in Burma and Thailand earlier this year for a story on refugees, Fort Wayne News-Sentinel photojournalist Steve Linsenmayer captured hours of audio and video along with still photos. The resulting multimedia presentation was featured on the paper’s Web site and in a show on the local public TV station. Fort Wayne News-Sentinel photographer Steve Linsenmayer packed a Sony video camera and mini-disk recorder along with his two Nikons when he traveled to Burma and Thailand earlier this year. His subject: refugees – a passionate topic in Fort Wayne, which has the largest population of pro-democracy Burmese dissidents in the United States. Linsenmayer brought back much more than a story for readers of the paper. Linsenmayer’s multimedia efforts are testimony to the expanding capabilities of photojournalists who are stretching their talents – and the newspapers’ ability to reach readers – by picking up a video cam. Increasing newsroom emphasis on the Internet is encouraging experimentation with new storytelling mechanisms. Many see the foray into moving pictures as a natural progression of the profession, which already has seen darkrooms and film replaced by laptops and fingernail-sized digital cards in just the past decade. More stylized than TV news clips, the best of the three-minute videos shot today by photojournalists can be as haunting as a single image and as informative as a 1,000-word story. Concerned about overzealous use and expenses – not to mention the extra time required and the risk of missing that perfect shot while fumbling with additional equipment – photojournalists are cautiously optimistic about the latest technological tools. But, for better or worse, video cameras, iMovie editing software and Flash multimedia tools are changing the job description for many. 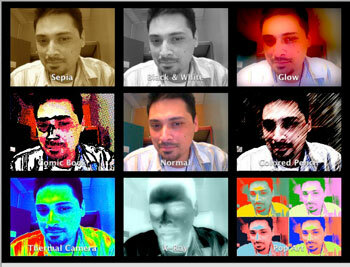 Richard Koci Hernandez, deputy director of photography/multimedia at the San Jose Mercury News, created this self-portrait using a Web cam and PhotoBooth, a new software program from Apple that allows the user to create a variety of styles. Koci Hernandez is experimenting with ways to use the software on the paper’s Web site. Across Knight Ridder, the charge is being led by a small group of enthusiastic photojournalists, many self-trained. 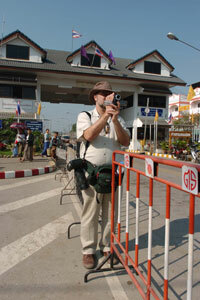 Before his Burma trip, Linsenmayer’s only experience was shooting home movies of his wife and two kids. At the San Jose Mercury News, photographer Richard Koci Hernandez was the first to take the leap last year, learning on-the-job with a camera purchased by the paper. Now Hernandez leads technical training workshops, teaching his colleagues how to use the camera and microphones and how to compress the files so they can be transmitted quicker. Recently named deputy director of photography/multimedia, Hernandez says many photographers resist the push because they don’t want to become second-rate broadcast journalists or lose sight of the power of still images. They also worry about taking on additional responsibilities and whether the newspaper will spend the money to purchase quality equipment.